PanARMENIAN.Net - Hollywood producer Stepan Martirosyan has been extradited from Russia to Armenia, where he is accused of fraud, the press service of the Armenian police revealed on Wednesday, September 12. 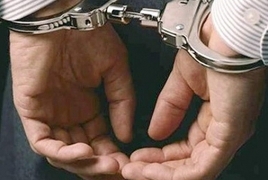 Martirosyan, a citizen of the United States, was set from Russia to Armenia on September 6 after he was declared wanted by the Armenian police on fraud charges. In Armenia, Martirosyan was arrested in absentia. Earlier, the Supreme Court of Russia recognized as lawful the decision of the Prosecutor General's Office to extradite Martirosyan, who has in the past worked with such stars as Mark Wahlberg and Arnold Schwarzenegger, RIA Novosti reports. Since October 2017, the 59-year-old producer was detained in Moscow due to Armenia's request for extradition. Martirosyan is accused of appropriating $50 million meant for the purchase of movie rights.